LAFAYETTE, Ind. 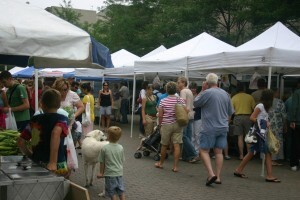 — The historic Lafayette Farmers Market opens its 2009 season on Saturday, May 2. The Market operates in Downtown Lafayette on Fifth Street between Main and Columbia, and will also operate a new location in West Lafayette on the campus of Purdue University. The Farmers Market season is May 1 through October 31, and is open in its Downtown Lafayette location on Tuesdays and Saturdays from 7:30a–12:30pm. The new West Lafayette vending location will be open Thursdays from 3:00p–6:30p from June 4 through August 13 in the Dauch Alumni Center Parking Lot at 403 W. Wood Street on Purdue University campus. From August 20 through October 29, the Market will move back downtown on Thursday evenings from 4:00-7:00 pm. The number of growers and the amount of produce on a given day is dictated by the natural progression of the growing season. An early arrival will assures the best selection.